There are many old stories swirling about in the history of motorcycle drag racing. And occasionally these stories catch the interest of today’s motorcycle drag racing faithful. These various tales from the past are always interesting, and on occasion shed some light on the evolution of motorcycle drag racing. 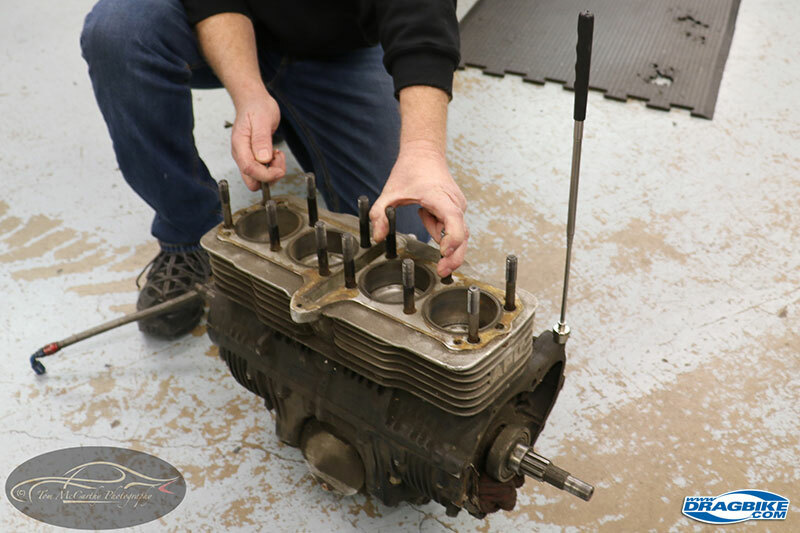 Like the story of the cast iron Top Fuel motorcycle engine cases that were made for Vance & Hines Racing, back around 1981. Some racers and fans wonder: did they really have cast iron or steel Suzuki GS cases for their Top Fuel motorcycle? How did that happen and if it did happen, where are they now? How many were made? Is this another drag racing myth, or did this really happen? Terry Vance, from 1981 through 1984, raced in Top Fuel motorcycle, winning two national championships. He did so with cast iron, Suzuki, engine cases. 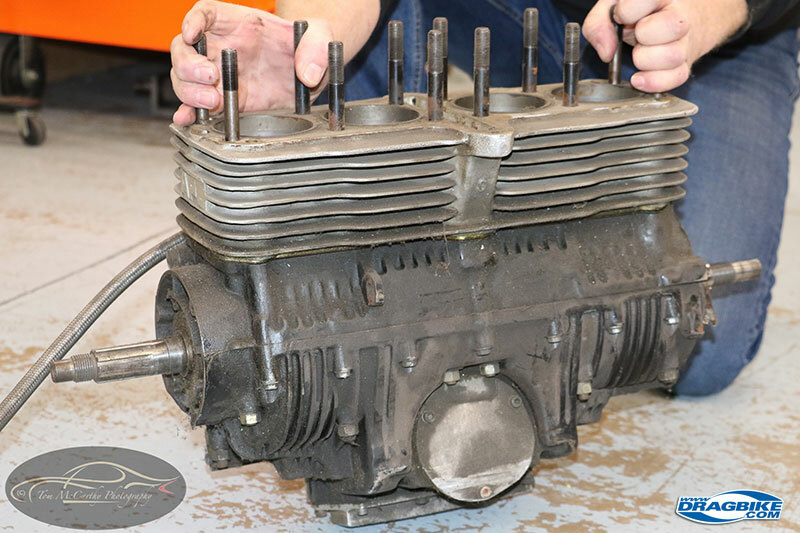 Ladies and gentlemen, friends, family and floosies: yes it’s true, there really were and in fact ARE, cast iron, Suzuki GS based, Top Fuel motorcycle engine cases in existence. They were once owned by the Vance & Hines Racing team of Terry Vance and Byron Hines. I’m here to tell you, this is not a myth and I’ve got the photographs to prove it. Better yet; Terry, Byron and Larry McBride are all happy to share with you, this unique tale of Top Fuel Motorcycle drag racing history. So let’s start from the beginning and I’ll tell you a story of Top Fuel drag racing history from yesterday. This story begins during the Jurassic Period of Top Fuel motorcycle drag racing. Back when Top Fuel motorcycle racing was at its peak during the early to mid 1970’s. At this time, Top Fuel motorcycle had the most diverse participation, competition wise, the class ever enjoyed. 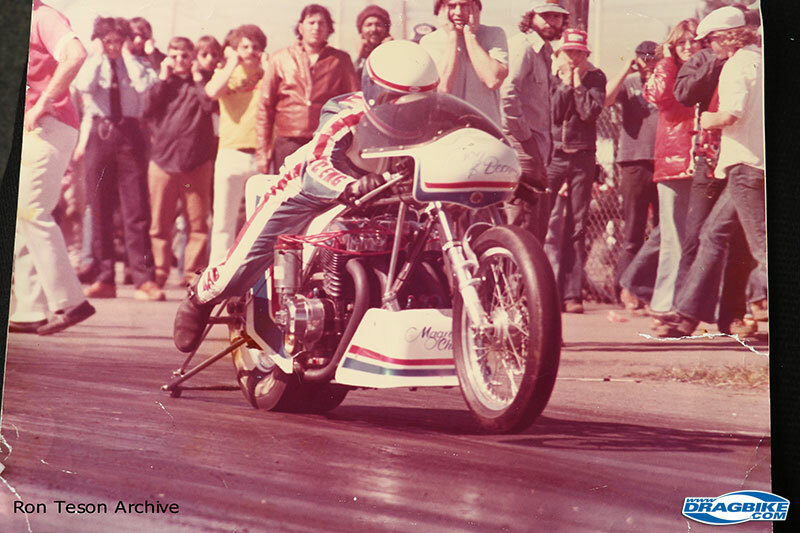 During drag bike motorcycle racing events from 1974 through 1977, Top Fuel class entries included double engine Norton drag bikes, Triumph Twins, double engine Harley Shovelheads, and double-digit numbers of contestants battling it out to get on the eliminations ladder on Sunday. For Top Fuel motorcycle, this was a historic and pivotal time for the class. The Teason & Bernard Top Fuel Honda changed everything for T/F motorcycles in the latter part of the 1970’s. 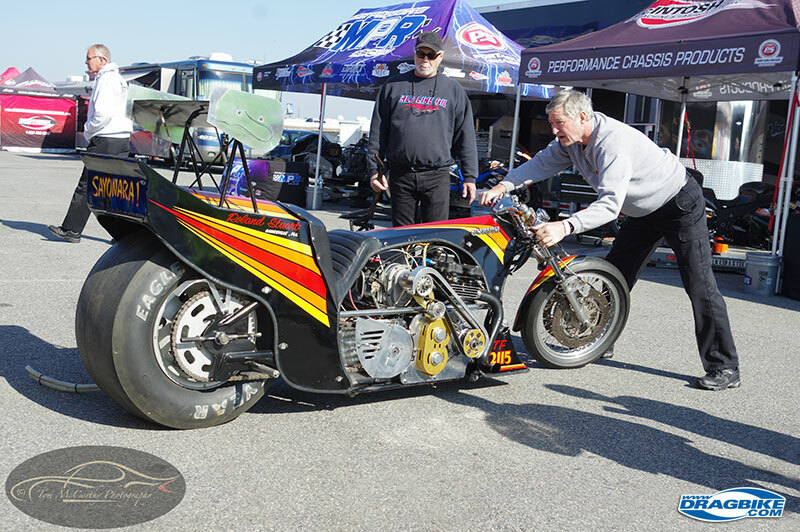 A huge step in the metamorphosis of Top Fuel bikes then occurred when a motorcycle drag racer named Ron Teson created a drag bike that changed all that. Ron Teson took a bored out 750 Honda based power-plant and with vital help from Jerry Magnuson, they added a roots-type supercharger to his drag bike. Together they created a single engine, blown, fuel injected Top Fuel bike that was faster, and more importantly quicker, than any double could ever be. Ron brought forth the development of what would become known as the Teson & Bernard Honda Top Fuel bike. That motorcycle between the years 1977 to 1979 changed Top Fuel motorcycle class drag racing forever. It ended the era of double engine Top Fuel bikes because there was no way the ponderous weight of a double could get off the starting line and accelerate as quickly as a single, which at the time, was near half the weight of Top Fuel double. And with the supercharger huffing nitromethane, the motor could produce the power as the doubles. That was it for the doubles by 1980; the supercharged, single engine bikes were out running the doubles by a bunch. RS view of the Suzuki GS configuration motor, created by Byron Hines, with cast iron cases, sent by Suzuki to the VHR team in 1981. Note the APE cylinder block and cam chain tensioner. 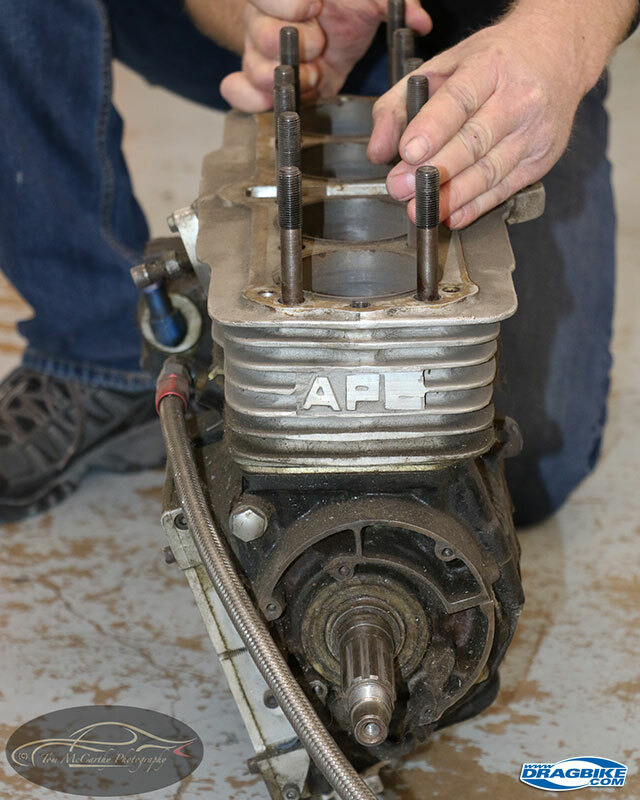 Jay Eshbach of APE has produced supporting products for Top Fuel motorcycles for decades and still does. However, this powerful new combination also created new problems for the teams who ran them. For example, Mike Gray and the Terminal Van Lines team, with Bo O’Brachta driving, went as quick as 7.08 during the NHRA Winston World Finals in 1980. When I first met Bo and interviewed him back then, I remember Bo telling me “We have to be careful with our lower ends as the cranks are only good for about three runs.” The reason was, once the bikes started making in excess of 350Hp, the stock factory engine cases would flex, causing the cranks to run out of true, in effect, twisting the crankshafts. Suzuki GS based design, cast iron cases, one of five sets created by Suzuki for VHR, in 1981. Sam Wills, who was driving for Carl Ahlfeldt in Top Fuel at the time, with a Kawasaki based bike remembers, “We would take a Kawasaki crank, true it up with fresh rods and bearings, and then we would weld Harley splined output shafts on each end of the crank.” Basically the Top Fuel bike teams were doing whatever they could to try and make parts live so they could tune the bikes and get to the most out of their combination. But crank life was poor at best due to cases being used at high-stress levels. In 1980, when Terry Vance and Byron Hines broke away from RC Engineering and formed Vance & Hines Racing, they decided to go Top Fuel racing to augment their dominating Pro Stock motorcycle racing program, but they knew they would be facing the same problems. So Byron Hines, seeing this problem up-ahead, asked their racing sponsor, Suzuki for help. They responded by making five sets of gray cast iron cases of the Suzuki GS configuration, for use by the VHR team. Byron knew he would need them to tune the new Vance & Hines Top Fuel bike, then under construction. Elmer Trett, during the 1980/81time frame of his Top Fuel career, was in the process of creating a single engine, blown, injected Top Fuel Harley until the Harley factory reneged on its promised sponsorship to him. He then switched to an Inline-4 cylinder motor configuration. Another pioneer from the class, Elmer Trett, during this time frame, was transitioning from a double engine Top Fuel Harley to single engine, blown fuel Harley, but the factory ran out of funding for his project. 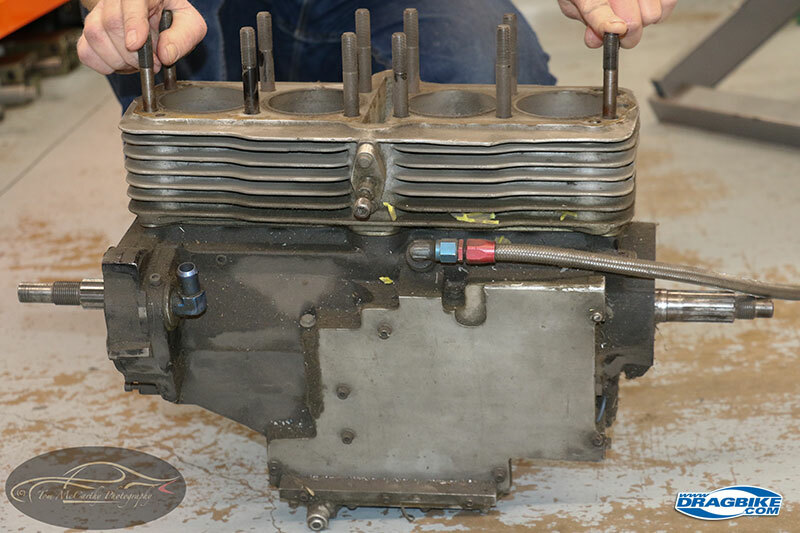 So Elmer bought blank cast aluminum cases from John Dixon and in the 1981 time frame, Elmer started developing his first I-4 motor with the help of Mike Gray, Ken Tipton, and Mike Murdoch. Elmer knew custom or aftermarket type cases were needed, but there were none for open sale in 1980. So he started making his own. Elmer never ran a Kawasaki engine block. 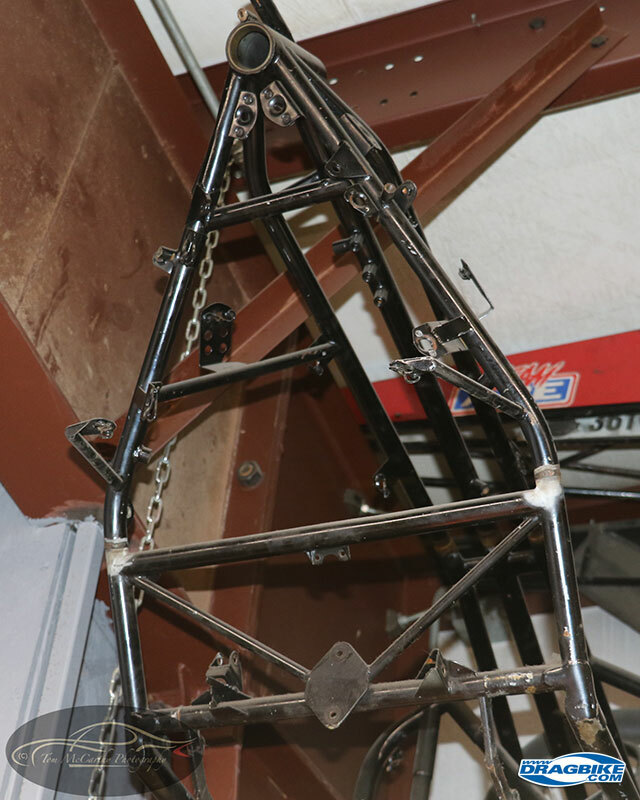 The Vance & Hines Top Fuel bike chassis, today, is resting comfortably with Sam Wills and is intended one day to be fully restored by it’s owner, Larry McBride. Meanwhile, Terry and Byron were a step ahead by having the cast iron cases, which in hindsight, was a good and bad scenario. They just didn’t know it at the time. You see, back then, during the development of Top Fuel motorcycles, the VHR team had more motor than they had chassis, by a bunch. Byron could call on 350 to 400 HP or more at any time, but the chassis flex was just frightening. Depending on track and tire conditions, Terry might have a straight run, or the bike would suddenly head off in whatever direction it needed to. The motorcycle was flat out scary and unpredictable to drive. The cast iron cases held the power, Byron could tune it, but Terry’s abilities to keep the bike in the same lane it launched in were sometimes challenged! Despite the handling difficulties, Terry and Byron were effective in winning two Top Fuel motorcycle championships in the early 1980’s, for Vance & Hines Racing. 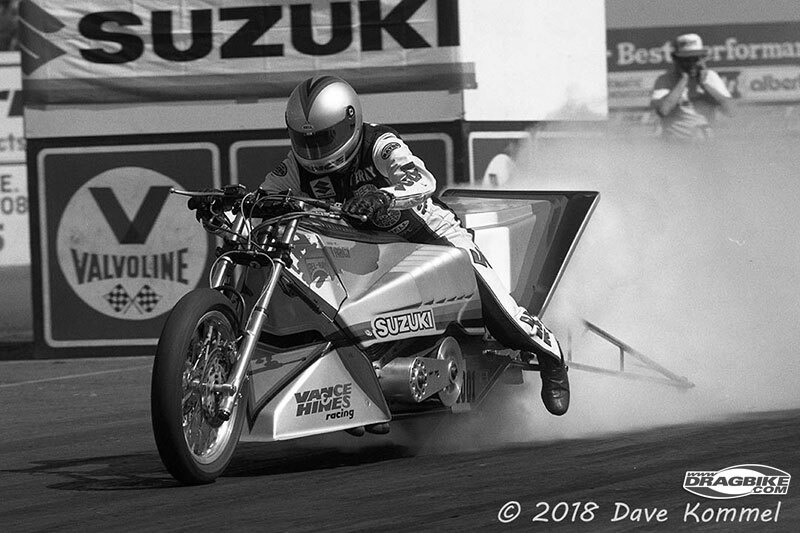 Performance wise they had a best of 6.98 @ 203 MPH out of that Top Fuel bike and they officially retired from the class in 1984, when the NMRA (National Motorcycle Racing Association) ceased operations. 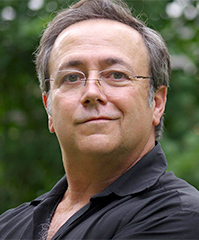 Terry switched over to strictly NHRA Pro Stock motorcycle racing and during his spectacular career, Terry earned 14 national championships before retiring from driving duties at the end of the 1988 season. In 1984, after Terry and Byron pulled out of Top Fuel motorcycle drag racing, they sold their Top Fuel bike, with all the spare components to Larry “Spiderman” McBride. 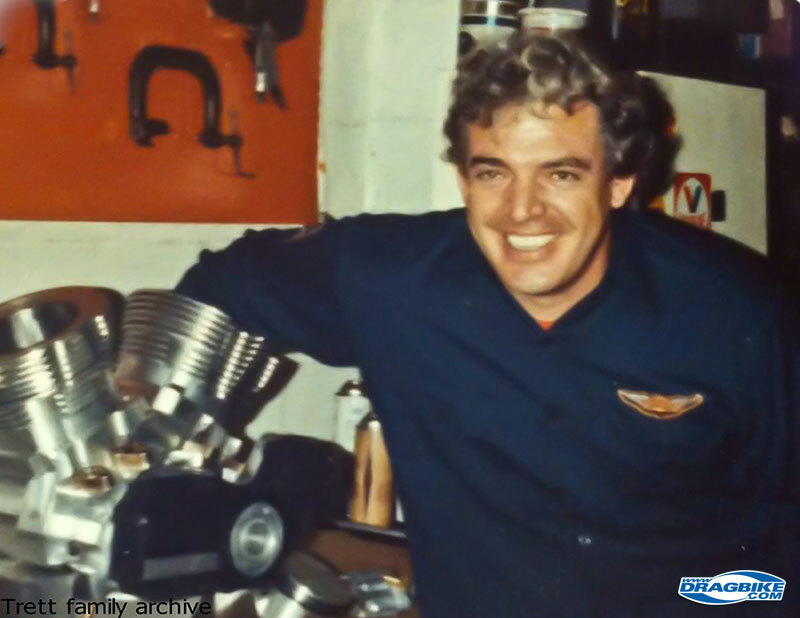 The Vance & Hines, Top Fuel bike became Larry’s first Top Fuel motorcycle he owned outright. Prior to this, Larry had been fuel bike racing for his good friend Squeaky Bell and then driving for Danny Johnson. Larry still owns the old VHR Top Fuel bike and as you’ll see in the photos with this story, as of 2018, that motorcycle and one of the cast iron engine cases, resides at Sam Wills shop in Oklahoma City. Rear view of the VHR Cast iron engine cases. This motor last ran in the 1980’s with Larry McBride at the controls. As best as Larry can recall: Sam Wills has one set of the cases, Ron Kroll had a set, Danny Johnson had a set. For sure, one set is still in Roland Stuart’s, Suzuki Top Fuel bike, the one he won Indy on in 1982. The whereabouts of the fifth cast iron set of cases is a mystery at this time as of February of 2018. Roland Stuart has one set of the VHR cast iron cases in his Suzuki Top Fuel bike he won the 1982 NHRA, US Nationals with. Roland put the bike on display during the 2014 Man Cup World Finals. As you can see, it’s still race ready.Larry and Sam have every intention of one day restoring the Vance & Hines Racing Top Fuel bike to it’s 1980-1984 glory. Presently they are eyeballs deep in building new Top Fuel bikes for multiple teams, so the resurrection of the old VHR Top Fuel bike is on hold for now. This story was made possible through contributions by: Mitch Brown, of Monster Race Products, Mike Scott, Sam Wills, Terry Vance, Byron & Matt Hines, Larry McBride, Roland Stuart, the Trett Family, Ron Teson and the late, great Bo O’Brachta.